It was a little annoying, though, that the most important adjuvant — alum, the adjuvant most commonly used for human vaccines — didn’t fit into this explanation. We didn’t know what innate triggers alum tickled to drive immune responses. I’m not entirely convinced that this is the whole, or even the main, story. … simple experience says that while vaccines sting, you don’t expect any kind of large-scale necrosis in your injected arm afterward – no more than you’d get from a modest bruise, which isn’t enough to trigger the kind of adjuvant effects we see with alum. A paper that’s just become available in advance online status3 backs up my skepticism. Strictly speaking, uric acid itself does not act as a danger signal. Uric acid is a normal component of extracellular tissues, and if it was inflammatory we’d be in perpetual agony. When dying cells release their own stores of uric acid, though, the surrounding fluid becomes overloaded, and uric acid precipitates out as monosodium urate (MSU) crystals. It’s these MSU crystals that are actually inflammatory. Flavell’s insight was that MSU crystals might be conceptually siimilar to alum — another insoluble, particulate adjuvant — and so the two might act through the same pathway. Sure enough, knockout mice without Nalp3 (or without other components of the Nalp3 reconition particle) failed to respond to alum (or to uric acid), whereas knockouts for a different NLR member did just fine. The knockouts responded normally when a different adjuvant was used. 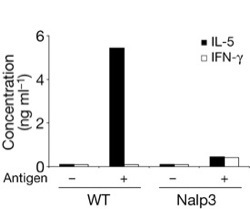 Thus, by eliminating signalling through the Nalp3 inflammasome, we have eliminated one critical pathway used by alum to initiate humoral and cellular immunity. In doing so, aluminium hydroxide adjuvants ‘hijack’ an innate immune pathway that is exquisitely sensitive to cellular damage, perhaps as a result of the similarity to MSU in its physical structure. The effect is pretty striking, actually (for example, the figure to the right). In vitro, alum induced cell death at very high doses … in WT macrophages and in macrophages deficient in Nalp3 and Caspase-1 (Fig. 3b); however, the induction of IL-1beta by alum did not depend on the presence of MSU because the addition of uricase, which degrades MSU crystals and prevents the induction of IL-1beta (ref. 10), had no effect on IL-1beta production in response to LPS and alum (Fig. 3c). I’m altogether happier with this explanation. One interesting question that leaps to my mind — now we know the genes involved in alum recognition — is whether natural variants in these genes exist (I’m sure they do) and whether such variants correlate with vaccine responses in humans. Could we predict whether someone only needs a single dose of vaccine to be protected compared to her cousin who needs three doses? Are there people who lack components of this altogether — like the various TLR3 mutants I talked about earlier — and what happens to their vaccine response? Kay, as always, the short answer is likely “Don’t know”. For uric acid — I’ve seen micrographs (not published, I think) of monosodium urate crystals mixed with dendritic cells. The MSU crystals are long, needle-like things and they actually seem to penetrate the cells, sticking right through them. Bizarrely this doesn’t seem to kill the cells. I find it hard to believe that this is actually what is happening — maybe it’s some kind of illusion, and the crystals end exactly at the membrane; or maybe the cells really are dead, though assays don’t indicate it — but it’s at least conceivable that it’s real and the MSU can physically enter the cytosol. I’ve never seen alum crystals and I don’t know if they look anything like this. Gene polymorphisms in the NALP3 inflammasome are associated with interleukin-1 production and severe inflammation: relation to common inflammatory diseases?Verma D, Lerm M, Blomgran Julinder R, Eriksson P, Söderkvist P, Särndahl E.
… RESULTS: Mutation analysis of the patient’s genes encoding NALP3, ASC, and TUCAN revealed variations in the NLRP3 (Q705K) and CARD-8 (C10X) genes. The allele frequencies of these single-nucleotide polymorphisms (SNPs) in the population were 6.5% and 34%, respectively. .. CONCLUSION: Our results indicate that the patient’s symptoms were due to elevated levels of IL-1beta, since treatment with anakinra effectively abolished the symptoms. The compound SNPs may explain the increased IL-1beta levels and inflammatory symptoms observed, but further studies are needed to reveal a functional relationship. The prevalence of the polymorphisms (4% of the population carry both SNPs) in the general population may suggest a genetic predisposition for common inflammatory disorders. it has been mentioned that alum activates the the innate immune system, my question is, how is a better immune response against an Ag conjugated with alum generated? i’m not as scientific as i’d like to be but right off the bat, uric acid signaling our immune system is just wrong. for uric acid to trigger something is just really physically painful. thanks for shedding light on this. i always enjoy your posts and expanding my knowledge on health and science.